MY BARBARA is one of the most luxurious ships available for 7 days yacht charter in Croatia and cruising along the Croatian coast and islands. Has exceptional liveaboard spaces; 220 square meters of open area for leisure and sunbathing, open terrace for 35 persons, inside and outside lounge area, air-conditioned salon for 35 persons. Abandon yourself to the pleasure of travelling in the safe hands of our captain Ante and experience the adventure of the Croatia cruise. If you look for an yacht charter for group of friends, unforgettable Dalmatian luxury cruise, generous hospitality, highly selected quality of service, My Barbara is perfect for you. 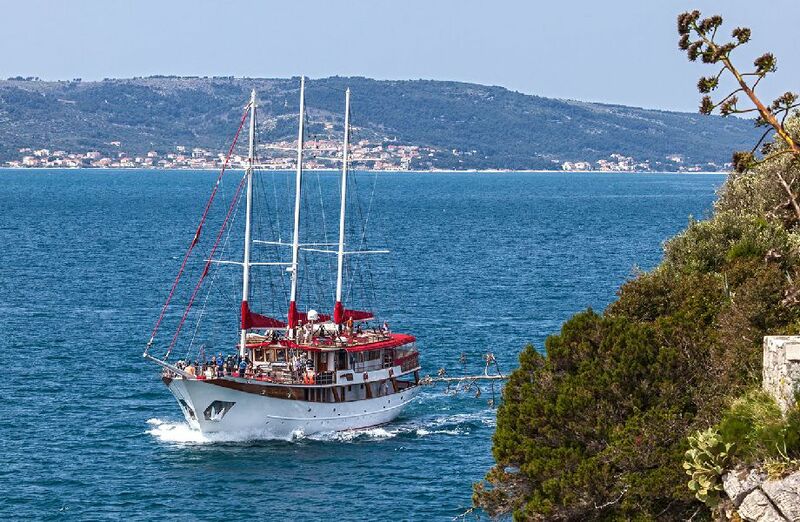 BARBARA is luxuriously equipped for Adriatic cruising, has 16 fully equipped cabins for 35 guests. All cabins are extra comfortable and above sea level with one or two windows. Each cabin has two twin beds (90×180 cm), one double bed (160×180 cm, 180×180 cm). Cabins are with air-conditioning, LCD-TV, free wireless internet, working tables, mirror, safety deposit box, night lamps, wooden wallboards, chair, electricity supply, safety and fire alarm installations, sanitary facilities, toilet and shower with cabin. Cabins are located on the lower deck and on the main deck. There are 7 members of CREW: the captain, cook, two sailors, a hostess, cook assistant, and waiter are always at your disposal; they do their best to make your cruising memorable. All cabins are extra comfortable and above sea level with one or two windows. Each cabin has two twin beds (90×180 cm), one double bed (160×180 cm, 180×180 cm) or one double bed (160×180 cm) plus one extra single bed (90×180 cm). Cabins are with air-conditioning, TCD-TV, free wireless internet, working tables, mirror, safety deposit box, night lamps, wooden wallboards, chair, electricity supply, safety and fire alarm installations, sanitary facilities, toilet and shower with cabin. Cabins are located on the lower deck and on the main deck.